Cooking stoves are crucial backcountry gear. They allow for cooking those high-calorie meals, the lifeblood of any hiker after spending hours trudging through forest, field and/or wetlands. However, stoves are only as good as their fuel, for without some type of combustible material, they are just a useless trinket cluttering up your backpack. Determining the amount of fuel to carry is often more art than science – not enough, you have to force down soggy uncooked oatmeal, too much, and you beat yourself up for carrying the extra weight. Fortunately, Solo Stove has solved this dilemma by creating an attractive line of stoves that burns a fuel that is so readably accessible in the Adirondacks that there is almost never a reason to carry it. No, the stoves do not run on dirt, water or black flies (though that would be FANTASTIC – I need to get working on this ASAP), instead it burns twigs, bark, pine cones or any other combustible material (but probably not your hiking companion’s sleeping bag). You just need to provide the energy to collect the material from the forest floor and either matches or a lighter to start it. This idea is hardly new, as other biomass-burning backpacking stoves have been available for years. What is unique is Solo Stove’s simple double-walled design which functions as a natural convection inverted downgas gasifier stove. What exactly does that mean? According to the manufacturer’s website, the stove uses airflow and a secondary burn created by its double-hulled burn chamber, combined with its ash pan, nichrome wire grate and cooking ring components to create a hotter and cleaner burn, resulting in less smoke and little impact on the surrounding environment. The double-hulled design of the burn chamber allows for increased airflow, where rising hot air and the absence of oxygen from the fire pulls air through the bottom exterior vent holes. This air flow fuels the fire at its base while also providing a boost of preheated air through the interior vent holes at the top of the burn chamber. This preheated oxygen fuels the flame resulting in a more complete combustion, and thus a hotter fire with less smoke. An ash pan at the bottom of the burn chamber collects loose ash, preventing it from clogging the airflow. The elevated pan acts as a heat shield, preventing the hot ash from negatively affecting the delicate biota within the soil beneath it. Above the ash pan is a nichrome wire grate, which holds the combustible material, providing for ample oxygen from below, which enables the fire to burn faster and hotter, simultaneously allowing the spent ash to fall out below into the pan. A detachable cooking ring sits on the top of the burn chamber and holds the cooking pot. The cooking ring directs heat up to the center of the pot for maximized efficiency. The ring also acts as a windscreen, although a bottom row of air vents still allowing oxygen to fuel the flame. The cooking ring inserts into the burn chamber when the stove is not in use, allowing for a more compact design. 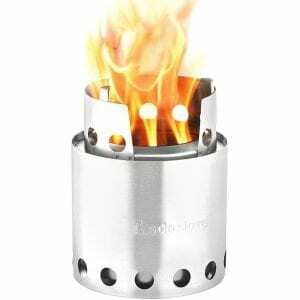 Solo Stove was nice enough to provide me with a free Solo Stove Lite to try out for this review. It weighs about nine ounces, and is appropriate for 1-2 people, making it an ideal size for an Adirondack backcountry adventurer. The Solo Stove Lite retails for $89.99, although currently it is available for $69.99 at the company’s website. In addition, it comes with a money-back guarantee and a lifetime warranty against defects. The Solo Stove Lite is no ultra-lightweight stove, unfortunately. The 304 Stainless steel construction makes it durable enough for backcountry conditions, but accounts for the heavier weight, although a titanium version could ameliorate that considerably. The Solo Stove’s weight dwarfs my Pepsi can stove’s weight of nearly three ounces, which includes the stand, stakes and collapsible fuel container. Although my current Pepsi can stove is much lighter, the required denatured alcohol fuel makes all the difference. It takes about a half liter of fuel to get me through a 7-9 day backcountry adventure, which equals about 13.8 ounces – nearly 5 ounces more than the entire Solo Stove! These stove specs are fine, but my first thoughts were about its performance in the field. More importantly, how would it perform against my current go to stove, the homemade Pepsi-can stove? To satisfy my curiosity, I cooked up a little field experiment. With both stoves set-up near a stream (for access to a plentiful supply of water), I fired up each stove separately with the intention of boiling a standard amount of water in the same pot. A cupful of water was my standard amount (a cupful being equivalent to filling my titanium mug with water, not the standard volume measurement of a cup). I measured the time it took for steam to visibly appear from the little vent hole in the pot’s lid. The results were quite stunning. The Solo Stove only took 4 minutes and 45 seconds to boil the water, while my current can stove took a whopping 10 minutes and 11 seconds. Placing the alcohol stove inside the Solo Stove cut the time for the alcohol stove down to 7 minutes and 50 seconds, proving the superior insulating ability of the Solo Stove double-walled design. 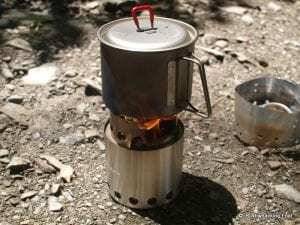 Although the Solo Stove Lite boiled water in considerably less time than my current alcohol stove, there are some other relevant factors to consider. The amount of time to find wood for the Solo Stove was considerable, especially given the wet summer we are currently enduring in upstate New York. In addition, it took me quite a number of matches to get the moist wood to ignite and form hot coals, even though I started with a small portion of a fire starter stick. In contrast, I nearly burned my hand lighting the alcohol stove on the first match. The Solo Stove Lite is an efficient and well-made backcountry stove that burns wood and other biomass. Its fuel is readily available within the Adirondacks backcountry, making it a viable choice for any backpacker wanting to abandon using liquid or gaseous fuels on their journeys. Photos: Solo Stove Lite courtesy of Solo Stove; testing the Solo Stove Lite by Dan Crane. Dan Crane writes regularly about bushwhacking and backcountry camping, including providing insights on equipment and his observations as a veteran backcountry explorer. He has been visiting the Adirondacks since childhood and actively exploring its backcountry for almost two decades. He is also life-long naturalist with a Master of Science in Ecology from SUNY ESF and 10+ seasons working as a field biologist, five inside the Blue Line. Dan has hiked the Northville-Placid Trail twice and climbed all 46 High Peaks but currently spends his backpacking time exploring the northwestern portion of the Adirondacks. He is also the creator of the blog Bushwhacking Fool where he details his bushwhacking adventures. Let’s all remember that while fuel for these stoves is plentiful in the Adirondacks, they are illegal to use in our most popular area, the Eastern High Peaks. Further information about the prohibition of wood fuel cookstoves in the EHP is available on the DEC website. Thank you for mentioning that fact. As I rarely hike in that area anymore, I never thought to note the use of wood burning stoves are prohibited in the Eastern High Peaks Wilderness Area. You beat me to the comment! I had less luck with one, even with dry twigs. Was it a Solo Stove Lite or another wood-burning camping stove? I tried the “Stratus TrailStove” some years back but wasn’t overly impressed. It had a hose attachment that you could use as a sort of bellows. It was good in that I could make tea whilst under my tarp. But it is one more thing to carry. If I can’t make a fire I won’t eat food that needs to be cooked. I got plenty of fat to hold me over. Let me first say I NEVER camp in the Eastern High Peaks, and seldom visit them. So a fire ban is no issue for me. I have been using a Kelly Kettle for the last ten years. For those of you that are not familiar, a Kelly Kettle is an extremely quick way to boil water, my main requirement for my home dried meals. I have yet to use it below 15 F, but at any temps higher than that I can swear it’s faster than any alcohol or gas stove, and lightweight too! But it is bulky. They’re made in several sizes, and can be had in aluminum or stainless steel. Thanks for the review though, I enjoy seeing what else is out there and how it stacks up. Both the solo/bushbuddy stove and the kelly kettle use twigs,grass pine cones and ect as fuel but the kelly kettle is bulkier and with the solo/bushbuddy stove you need to use a pot to boil water/cook with. I have been using wood-burning backpacking stoves in the Adirondacks for many years. I started with three different models of Zip stove including two different battery blower driven models. I now have the larger Solo stove and swear by it after about 4 years of use. The Zip stoves are wonderful, however, they are made of aluminum, which is their downfall for long-term use. I found that the solo stove holds up extremely well for canoe camping. 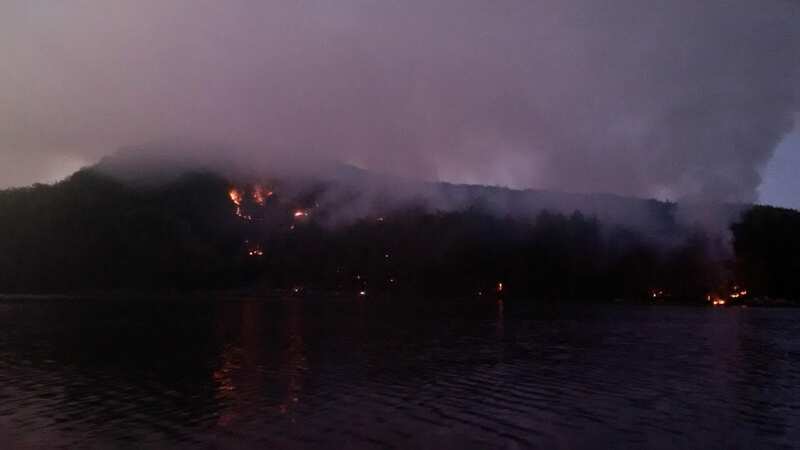 I recommend a wood-burning stove for use when camping in one spot for a few days, such as on a lake. The trick is to bring a small bag of hardwood splits in case you arrive in the rain. This weighs much less than liquid fuel. After collecting wet wood and drying it near the stove under your tarp you are good to go after the 2nd day. Keep in mind that these little stoves burn what amounts to basically twigs, pine cones, etc which dry quickly. Birch bark, pine pitch etc can always be used to heat things up. While I have used a couple wood burning stoves, they were always painfull to get lit. I resorted to the old school methode of Vaseline/cotton balls (or dryer lint) but these always made a mess of my pot and the two ounces they weighed, along with 3oz of dry wood I carried in a nylon sack, negated any weight advantage over the length of the trip. Soo, I went back to a 3.25oz remote canister stove and an 8 oz canister (weigh about 13oz) for a total of around 17oz counting the wind screen. This is good for 17 days out. No fussing with small twigs, sticks, tinder balls, and getting the thing lit…even after or during a good soaking rain. And, no mess to clean up when I get home. The pot, cup and lid are clean! Anyway, for long trips, like three weeks and more in the ADK’s, I would definitely recommend a good wood burner. But for short trips of 1-2 weeks, the time spent finding, preparing, and lighting a fire to cook on, then cleaning up when I get home, and wiping off soot after cooking to keep my pack from smelling like a bonfire are a bit much. Having never used a wood-burning camp stove, I’m curious about the nature of the wood fuel that can be used. You mention twigs, bark, pine cones, etc. In my experience, using that sort of material to start a regular campfire shows that they burn for a limited time and then you have to add more. Does that stuff burn longer in this stove? If you have to add more fuel to the stove, how do you do it? And how many fuel additions are needed to boil a couple of cups of water? Thanks for doing the test and review. During my one experiment with the Solo Stove, I gathered a handful of twigs (about a diameter of a pencil or smaller) and used most of it to boil that one cup of water. I felt this was a reasonable amount of twigs and originally thought I’d run out before the water boiled, but I did not. As far as adding more twigs to the stove while it is burning, there is a gap in the cooking ring (you can see it in the first photo), where you can add more twigs while cooking. I did add a few more twigs during my experiment, but luckily the water boiled before I ran out. Thanks, Dan. Sounds like it is more efficient than I would have expected. The solo stove is a heavier copy/knock off of the bushbuddy stove. Hello Dan! My name is Jennifer Kilcoyne and I am a teacher in Malone, NY. I am organizing a summer camp and am looking for someone to present to students on wild edibles. I am hoping you might be available or would know someone local who can help. Thank you!